According to the U.S. Government Census Bureau, in 2010 the average single-family house completed was 2,392 square feet. In 2009, the average single-family house was 2,438 square feet. Those "average single-family-house residents" are living in mini mansions when compared to our small spaces in Paradise. 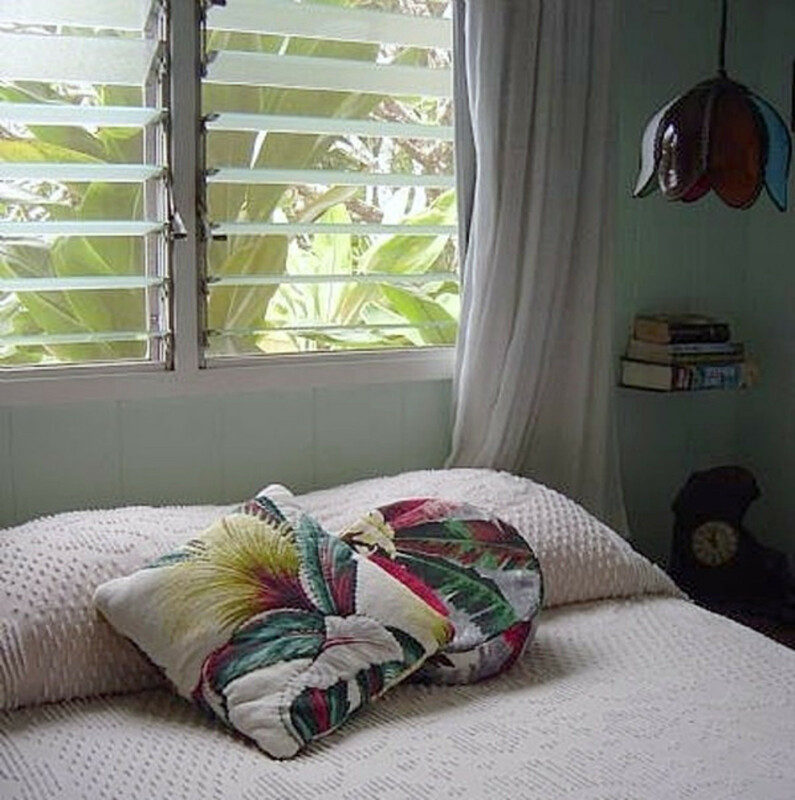 Our single-family home in Hawaii measures 640 square feet, so believe me when I say I KNOW small spaces. 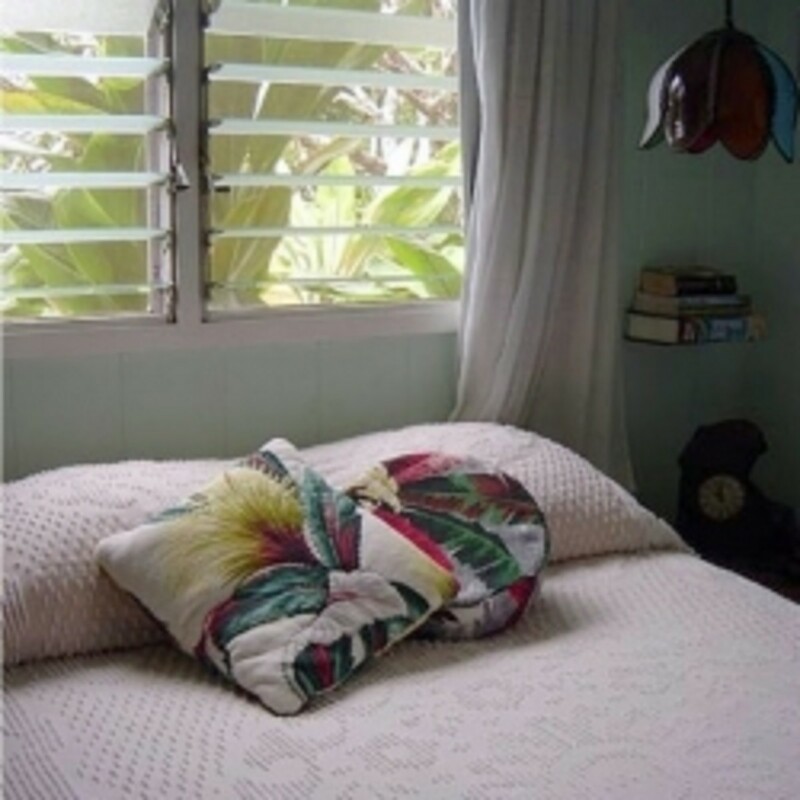 I can definitely tell you how to go about making the most of small spaces and how to extend square footage. Whether it's a matter of limited quantities of land being available or the affordability of housing, or perhaps a direct result of owning too many things, space is often at a premium for many people. For anyone who may be serious about making the most of small spaces, this page has been created with you in mind. The single best space saver in our small home! These featured bed risers will do the job. I've also used bed risers to elevate a couch for an elderly relative. It is now so much easier for him to get on and off the couch. It's good to know also you can buy a single bed riser to go with a set of 4 because many beds over twin size have an extra "leg" support in the center of the bed frame. Using bed risers, or bed lifts or bed elevators (whatever you wish to call them) allows for even more underbed storage which increases square footage in what would normally be considered wasted space. Unfortunately, standard bedskirts aren't long enough to cover the bed risers and the items stored under the bed. If you prefer you can make a DIY elongated Velcro bedskirt or purchase a 21" length bedskirt like the one below. Longer bed skirt covers bed risers. Another way we maximize our square footage at home is with the use of magnets. A magnetic knife rack is convenient in our kitchen for keeping our knives in sight and, of course, well out of the reach of small children. 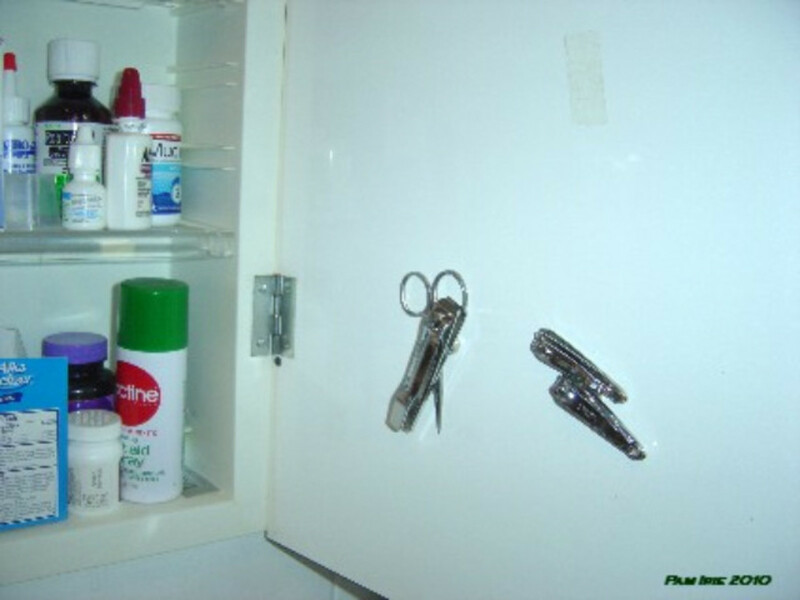 In the bathroom, our nail clippers and small scissors are kept orderly with the use of magnets applied inside the medicine cabinet door. This is one of the most clever space savers I've seen in a while. 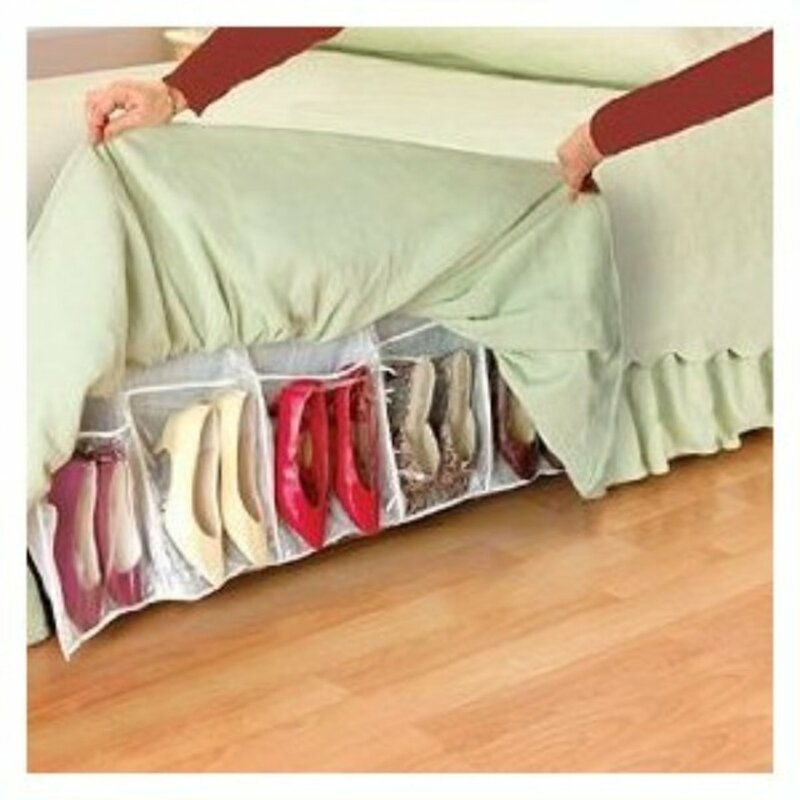 This is called the Storage Dynamics Shoes Away Hidden Organizer and it's available through Amazon. This product provides a great way to expand square footage by storing 16 pairs of shoes and keeping them dust free, saving closet space AND storing shoes out of sight at the same time. Clever design! Find an old mailbox, the type that hangs on the wall to utilize as small office storage space. 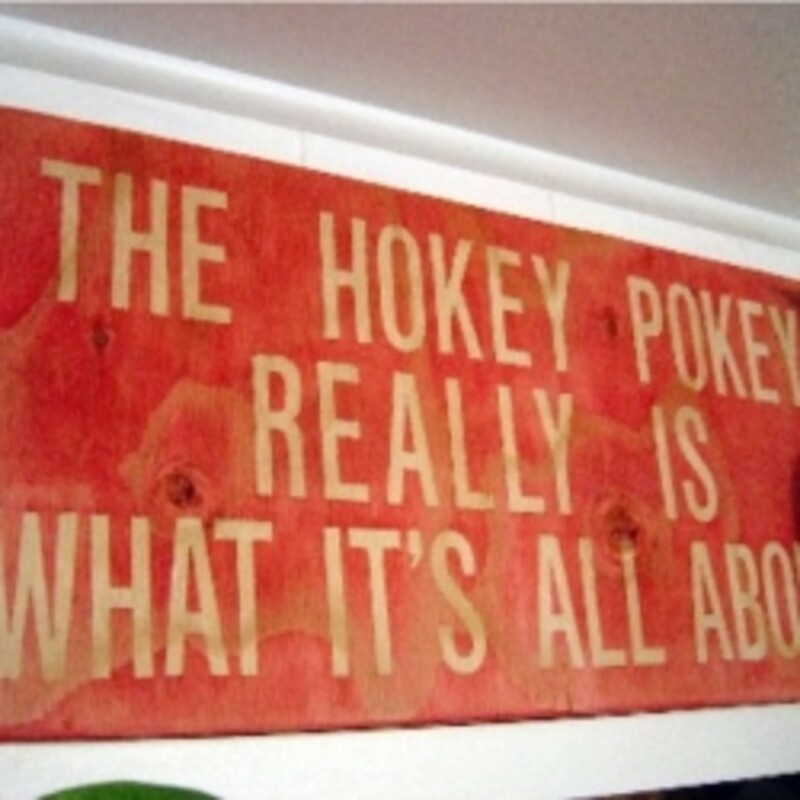 Look in flea markets, at garage sales and thrift shops. Check online sites like Ebay or Etsy. Clean the exterior of the mailbox with mild soap and warm water. Rinse well and allow to dry. Shine with a metal polish if desired. Protect the patina for the small office storage space mailbox by spraying the exterior with a satin finish polycrylic. 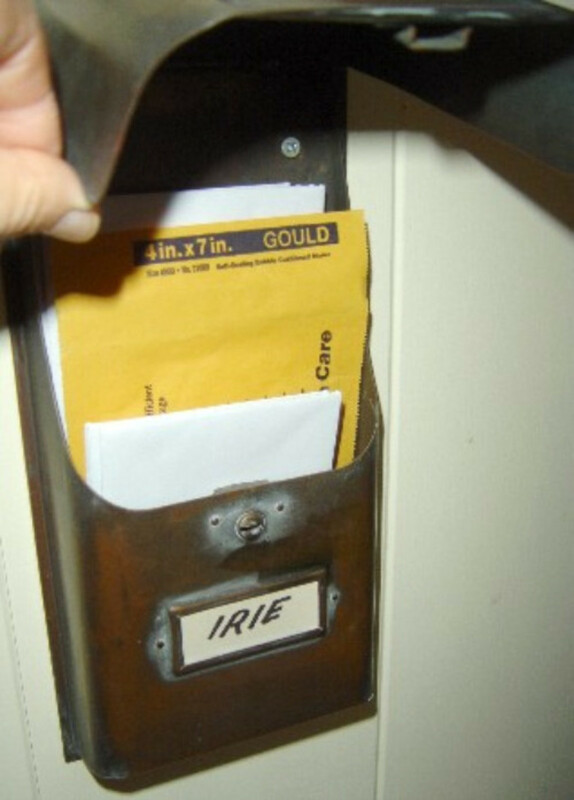 Write your last name on a piece of paper for the name slot or use the paper as a label to identify the contents. Hang the office storage mailbox on the wall. Insert letter and business size envelopes into this stylish new small office storage. Lots of possibilities for these thrift shop finds. Anytime I find a vintage wooden spice rack at a thrift shop or garage sale, I snap it up. They can be used is so many ways to make the most of small spaces. They can store cosmetics in a bathroom, lots of nail polish can hang on the wall in a teens bedroom. I have several in use currently at our home. One repurposed spice rack hangs inside a storage closet in the hallway. The shelves with their handy built-in dowel "railing", are the perfect size to store my small bottle of latex craft paint. I can take stock quickly of the stock paint I have on hand. Here's one thrift shop spice rack I found recently. It's just waiting for a quick coating of spray paint and I'll put it to use once again. I have the single version of the Umbra Invisible book wall shelf in our guest bedroom. You can see it below in the picture. They are made of some sort of metal and are very sturdy. It truly looks like your books are floating on the wall. 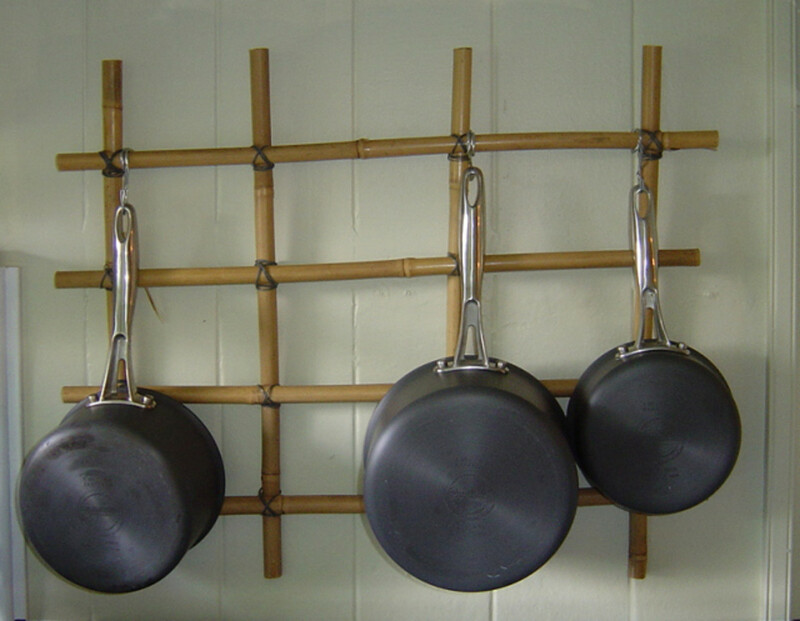 Free up valuable counter space in a small kitchen by making a trellis style pot rack of bamboo. 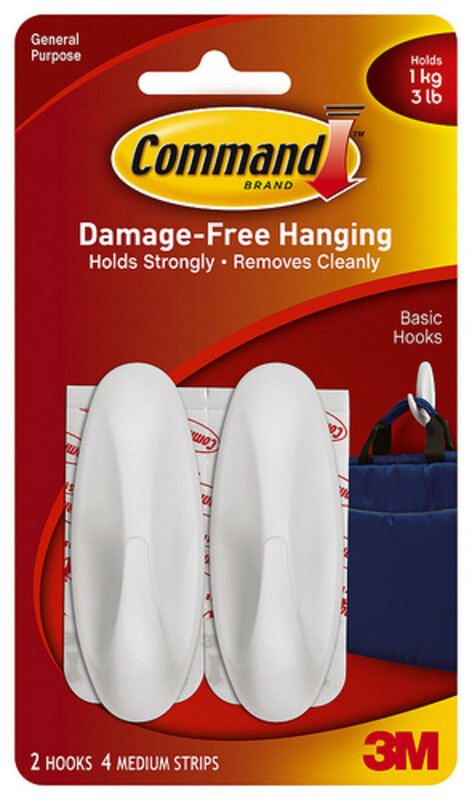 Utilize "S" hooks to hang the pot. Perfect for the galley type cooking space. Our tiny galley style kitchen is big on organization. It has to be......Products like this under cabinet coffee filter dispenser (pictured) and the paper plate dispenser (shown below) make the most of every inch of storage in this very small space. I LOVE this dispenser. 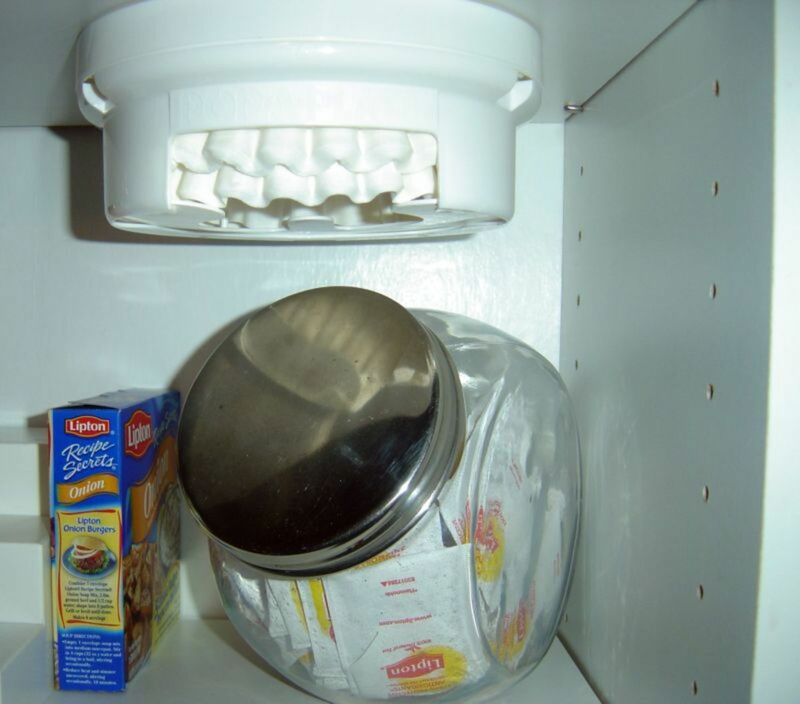 It was very easy for me to mount under the shelf and keeps the coffee filters close at hand. Perfect for my herb garden! These tipsy pot planters are not only fun to look at, they are practical too. 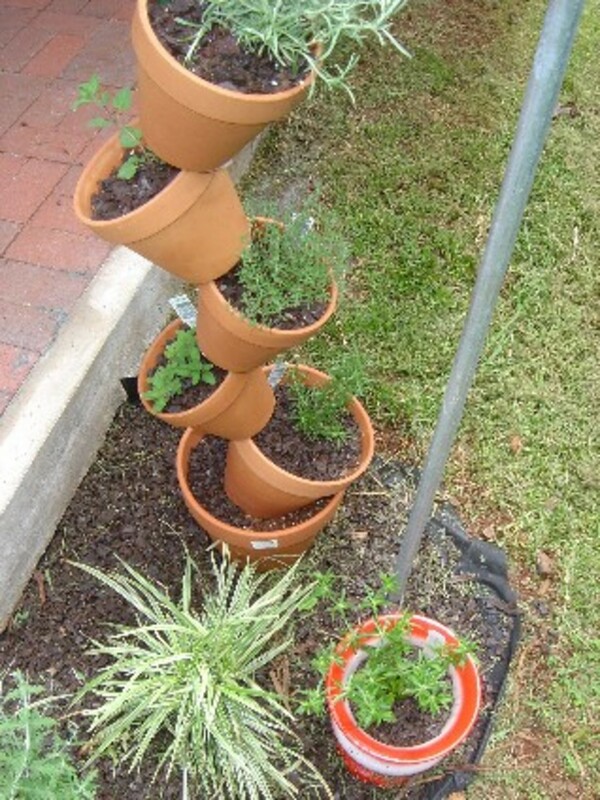 I found this idea on the internet and this picture is of my little herb garden just off our lanai. My husband has been surfing the same spot on Oahu since he was 11 (over 40 years). He has lots of surfboards... different sizes, shapes, different number of skegs, etc. all for different surfing conditions. 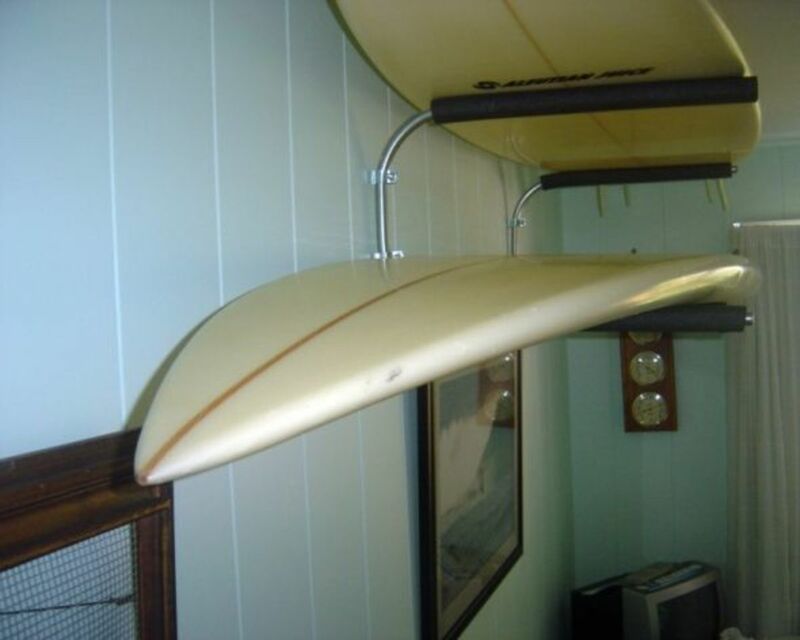 We have surfboards stored on the interior walls, on the exterior walls, under the lanai roof, under the house on racks too. Surfboard racks to the rescue! I don't have space left under my bed to store wrapping paper, nor do I have an entire area I can devote to wrapping packages. 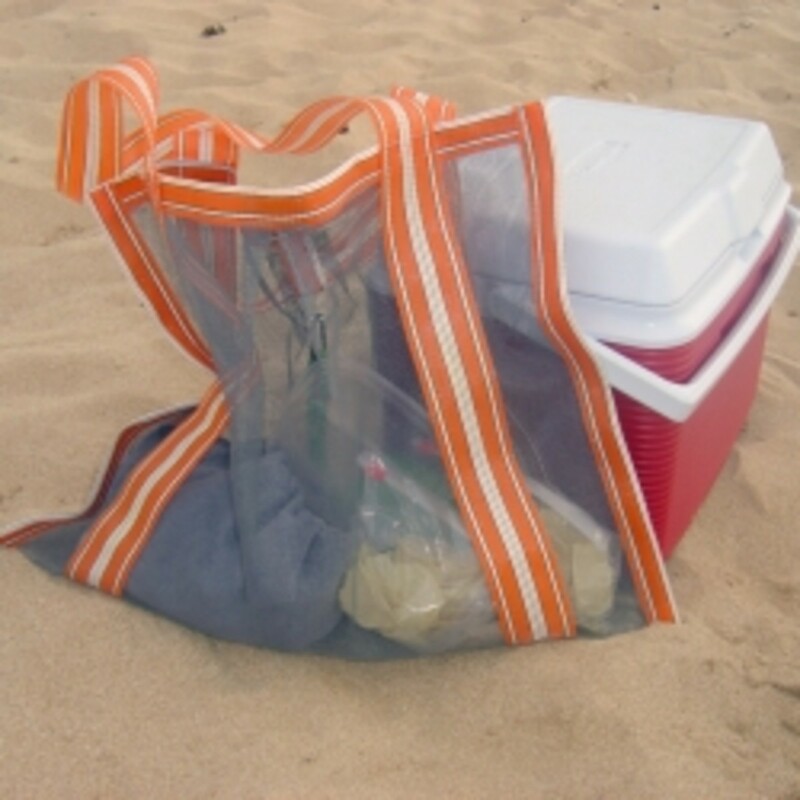 The geniuses at Better Homes and Gardens came up with this practical, inexpensive solution. Read on to learn how to make this portable gift wrapping station. It'll be done in no time! Gift wrapping paper, ribbons, assorted tapes, etc. Assemble the materials to make the portable gift wrapping station. Cut dowel to 15" length. Place the apron on the bucket, making sure to position it so the handle ends are located where the apron is sectioned. On each side of the bucket drill a hole large enough for your dowel to fit through. The dowel serves two purposes...it will hold your spools of ribbon and serves as a handy divider for the contents of the bucket. Hold the handle upright. Stick one end of the dowel through one hole to the left of the handle end. Push dowel in so it's protruding about 4" inside the bucket. Thread the ribbon spools on the open end of the dowel. Continue pushing the dowel into the opposite hole making sure this time the dowel is to the right of the handle end. This allows the handle to remain upright. Make sure the extended ends of dowel are the same length. Start filling pockets with scissors, adhesive tape, packaging tape, special pens, a 3-hole punch, shipping labels, address book, etc. 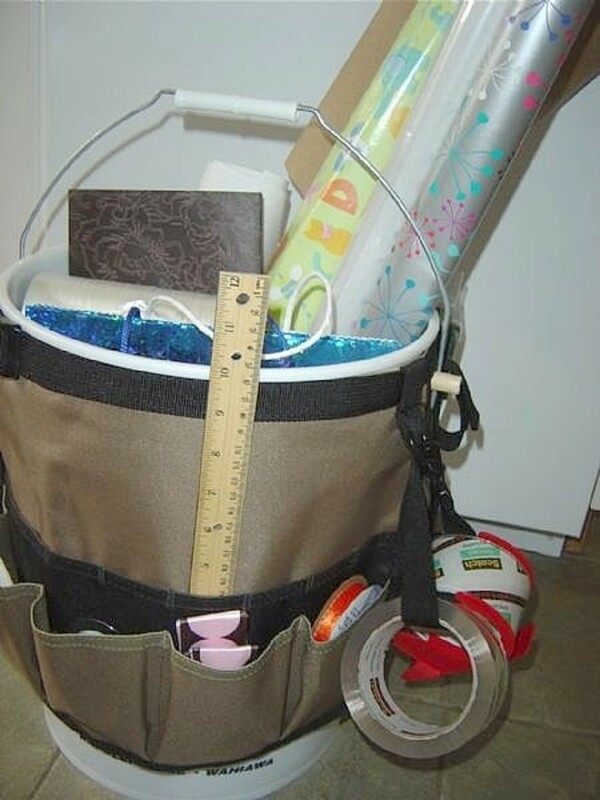 Fill the pockets of the portable gift wrapping station with all the items normally used to wrap packages. Stand up rolls of wrapping paper on one side of the dowel inside bucket and gift bags on the other side. Store this portable gift wrapping station away in a closet until ready to use. Store small bows in a plastic cup and insert the cup into a pocket to prevent them from crushing. This makes an easy, handy gift for a friend or relative who could use a little help with organizing and appreciates practical gifts. When drilling the hole for the dowel, the idea is for the dowel to fit snugly to stay in position. Use a drill bit that is a tad smaller than the circumference of the dowel. This allows the ribbon spools to move smoothly. Free up valuable space on nightstands by utilizing hanging lamps over each bedside. Swag lamps are easy to find and easy to hang. 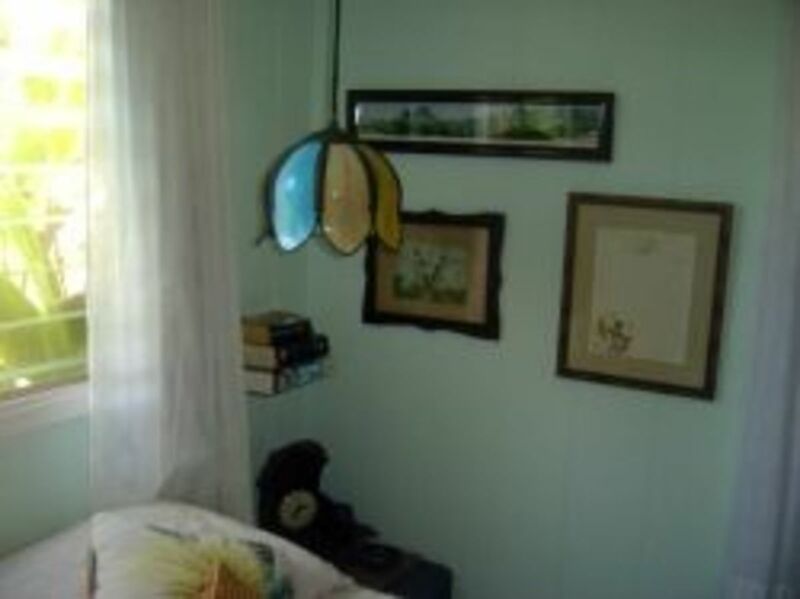 This DIY lampshade is a simple and inexpensive project to replicate and an innovative way to extend square footage. Thrift shops are a viable resource for lampshades. 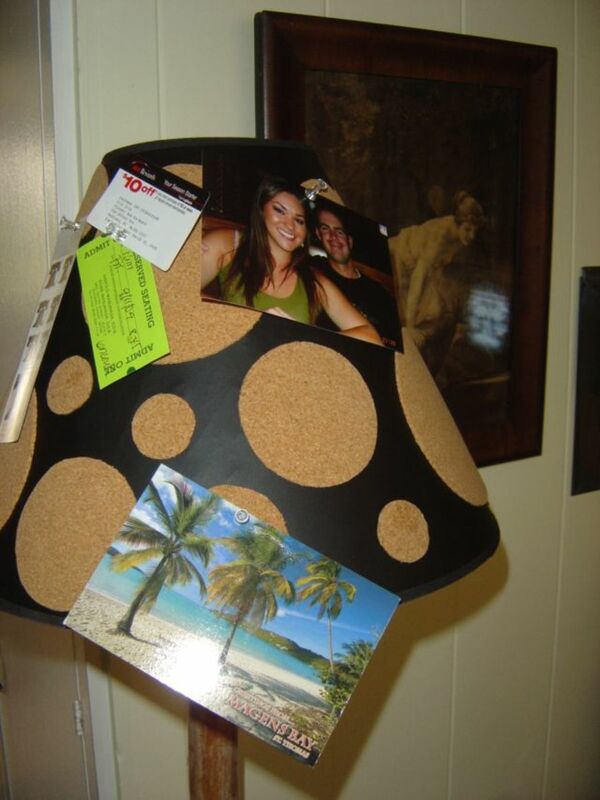 Apply latex spray paint and adhere self-adhesive cork circles to the surface and you've made a lampshade that doubles as a bulletin board. How much square footage do you live in? Well, let's just say there is a LOT of square footage to clean where I live. Do The Piles Of Paper Have You Down? First question of this Lens......(more space-saving questions further down the page) - Would you (or do you) use bed risers in your home? My bed is a Japanese style fuuton on the floor... so nope! I might, it never occurred to me. Yes I have been using bed risers for years. I've never heard of them before but might try to get some. I think I will try them. I had a bed built with drawers underneath. It sits low to the floor but has tons of storage. I love it. Very helpful lens. The idea of using magnets inside cabinet is great way to keep the clips where you can find them. Excellent ideas here. I'm probably weird, but I like my feet planted firmly on the ground, and I feel the same way about my bed. I know it's notional on my part, but the risers give me a feeling of instability. Of course, I live in earthquake country, but then I believe Hawaii has its fair share of earthquakes too, and you haven't had a problem with them, so perhaps I should reconsider. More storage space is always appreciated - I think bed risers is an ingenious solution! Well done! I had no idea these existed. What a great idea, I'm going to own by the end of the year for sure! Small spaces can be a challenge but you just have to make use of it wisely. I think this is a very good idea. Thanks! Nice lens! Great info and thanks for sharing! I have mattresses on the floor with no frame but I could see getting a frame in order to use these. I've never heard of these before. Thought provoking. Nice lens, good infos. Thnx. I need space for my jewelry studios and so I have to make the best of the small areas I have. Great suggestions. Great idea, I may think about it. I am learning to make the most of my small spaces. Hmm, if I got really desperate, this would be an awesome idea! I think we should switch to bed risers. Currently we're using an old waterbed base with drawers, but there's a third of the space underneath our bed that's not being used, and isn't even accessible! I've never heard of them but love the idea. Of course, with 6 dogs running around, I'm sure the dust bunnies would just have more room. I would definitely use them, as my room is tiny and I could do with more storage space. I used them once when I was living in the States, and it was very useful. Living in East Asia, I sleep on a futon that gets folded away everyday, so it's a moot point right now. They are very helpful though! I've never heard of bed risers but this is a great idea. 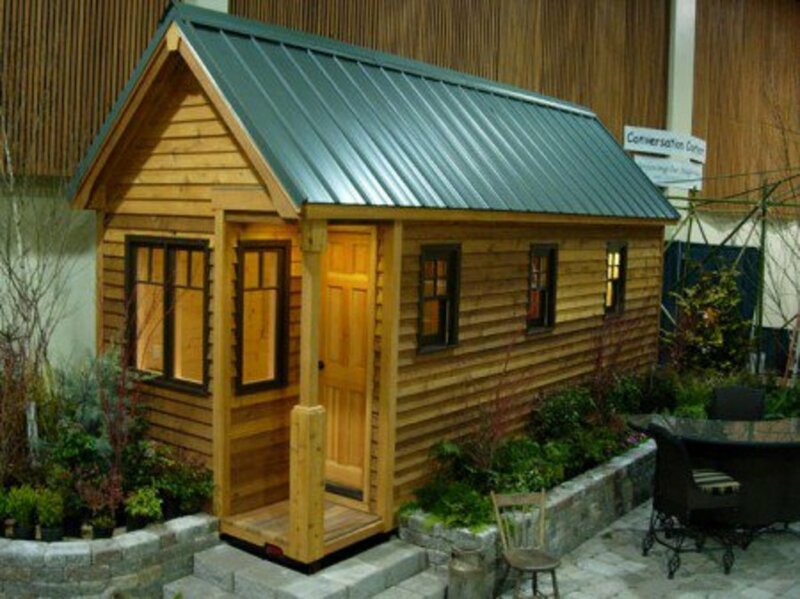 I live in a spacious house so I don't need one but for a small living space I would certainly consider it. I actually don't need bed risers. I have a metal bed frame that has 14 inches of space underneath. I would definitely use bed risers. My under bed storage is very under-utilized. I use bed risers for my work table, which is suppose to reach my chest for jewelry design. The bed risers work great. I also use them for my dining room table which is antique and way to low. Works great there too. No, but what a great idea. Who knew? We already have storage drawers under our bed, so we don't need bed risers. However, when our daughter is a bit older, we'll get her a loft-bed (like a bunk bed but without the bottom bunk), so that she can have a little table and chair set - she has a little box room, so she'll appreciate it. Great Ideas ! Getting ready to move, want to learn as much as I can about saving space, however, i'm pretty good at it now! I don't currently use them, but I think they are a great idea. Really useful suggestion! Thanks for telling about them. I'll check on how they'd work in our house. I know that this would give our cat more head room because she likes to hide under our bed. Yes I do and I use all that space underneath for storage and shoes! They are so strong, the same kind you have in your picture up there. I love them! No not yet, but good idea! Great ideas! I have never heard of bed risers before! Blessed! 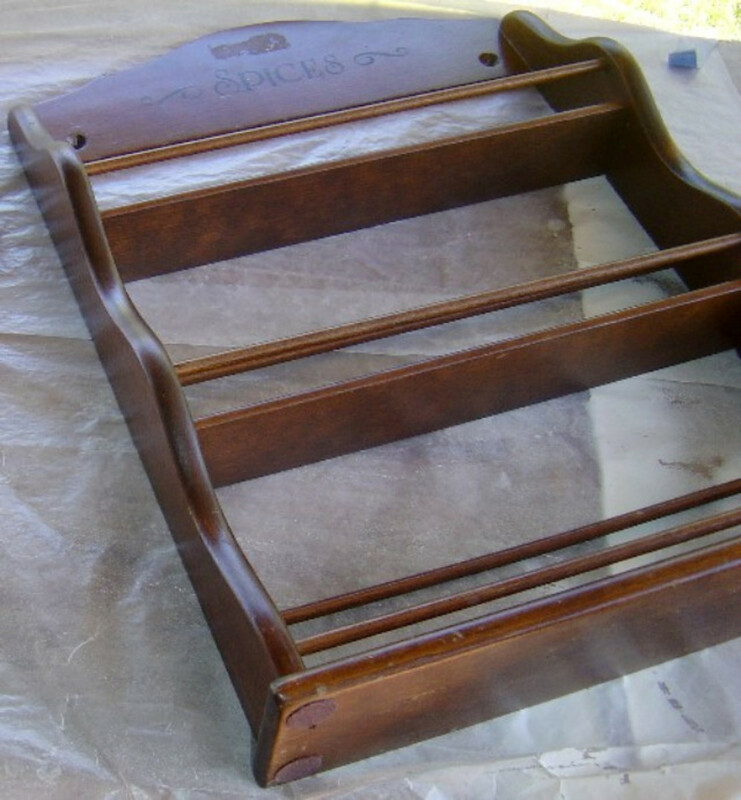 We used bed risers in our first home that was a cottage sounding similar to yours and they are a lifesaver for under the bed storage. Great lens and even larger homes can use space saving ideas! I love the ideas and am going to mention the bed risers to one of my kids that lives in a small apartment. Never can have enough storage space. We do and they help immensely with the extra storage space! Yes, I do use bed risers, but just on one side. I live in a teeny tiny basement apartment that leans to one side. LOL. Thank goodness for bed risers. Yes, and I have. they're smart! I would if I needed the extra space. Our bed is already pretty high (deep mattress), so probably not. But we do use the space under the bed for gift wrap and gift box storage. Pam, this is a really good lens...don't know what you were changing, but it looks good to me. Lots of great information about making the most of the space you have. Thanks for sharing. I've used them, and they are handy. But nowadays, I kinda prefer no space between bed and floor -- keeps little hands and paws away. @Frischy: I think people may be wary thinking that something made of plastic can support a bed and people too. Seriously, these are my very favorite organizing tools in use in my home. Those sound like a great idea. My bed is too low to store much under it, except Scarlett O'Hairy (she fits just fine) and some bubble wrap and small boxes I keep for mailing. 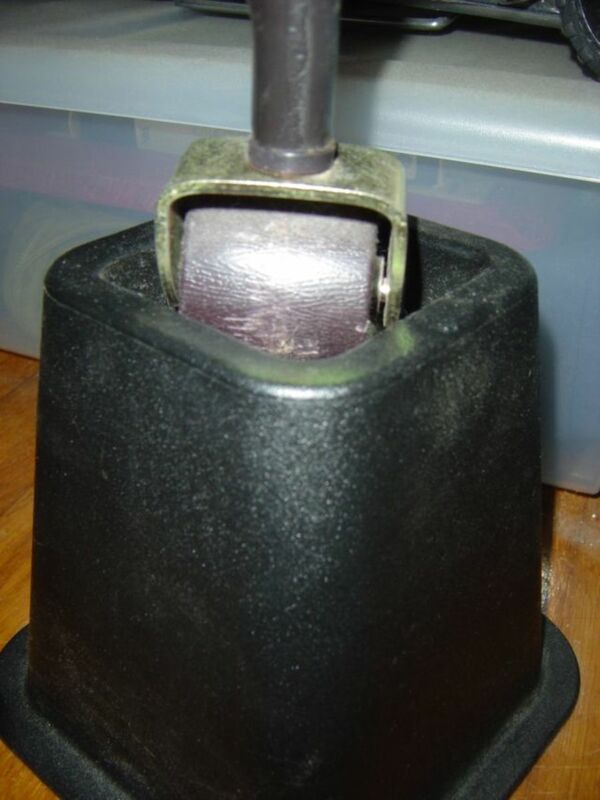 Yes, I have been using bed risers for quite a few years (about as long as you, I think). They definately increase the storage capacity of a small home. Each of our kids uses bed risers in their rooms and we store a ton under their beds!!! Couldn't imagine organizing their rooms now without them!